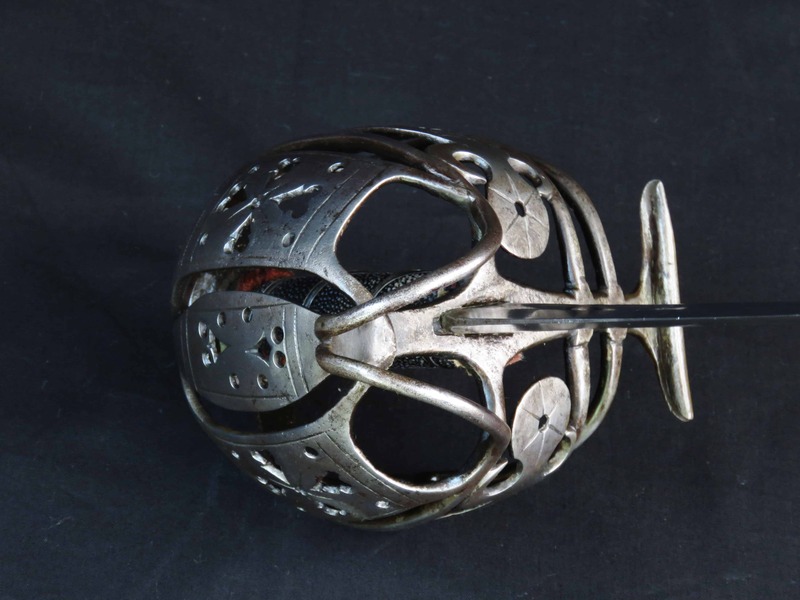 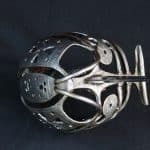 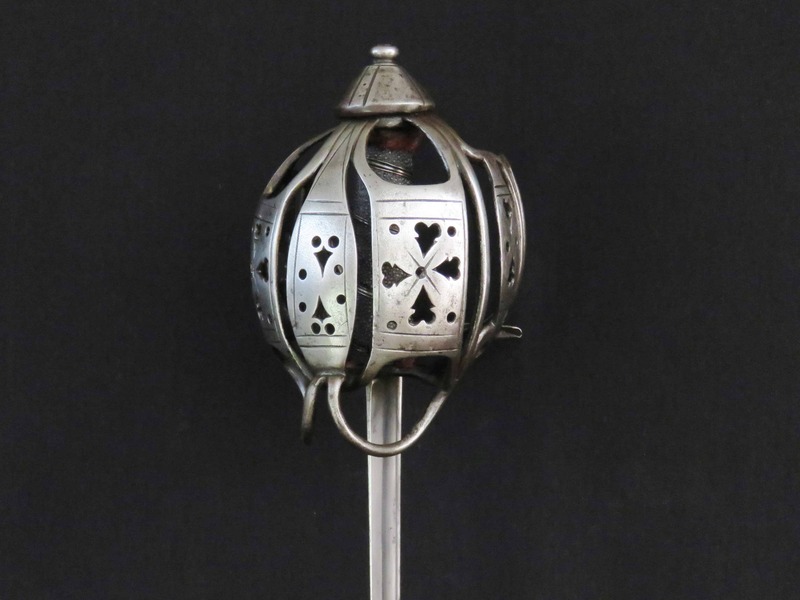 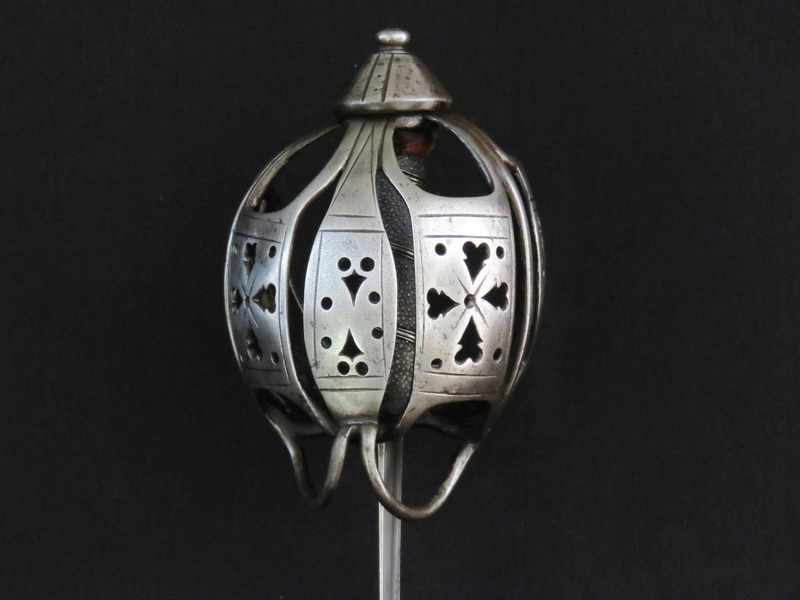 A fine and stylish Scottish basket hilted back sword dating to the second quarter of the 18th century. 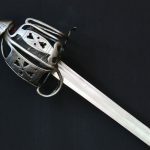 The sword has an imposing presence in hand and is a well balanced and robustly constructed weapon. 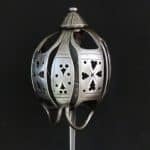 The fully formed basket guard is manufactured with sturdy, strong, round section structural bars and well formed panels, of high quality workmanship, creating an aesthetically appealing shape with smooth contours. 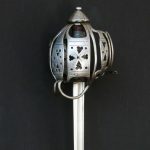 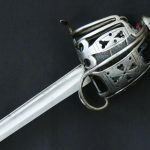 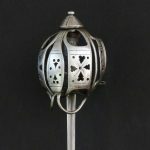 The front panels and side guard plates of the hilt are pierced with hearts, circles and engraved with angular border line decoration. 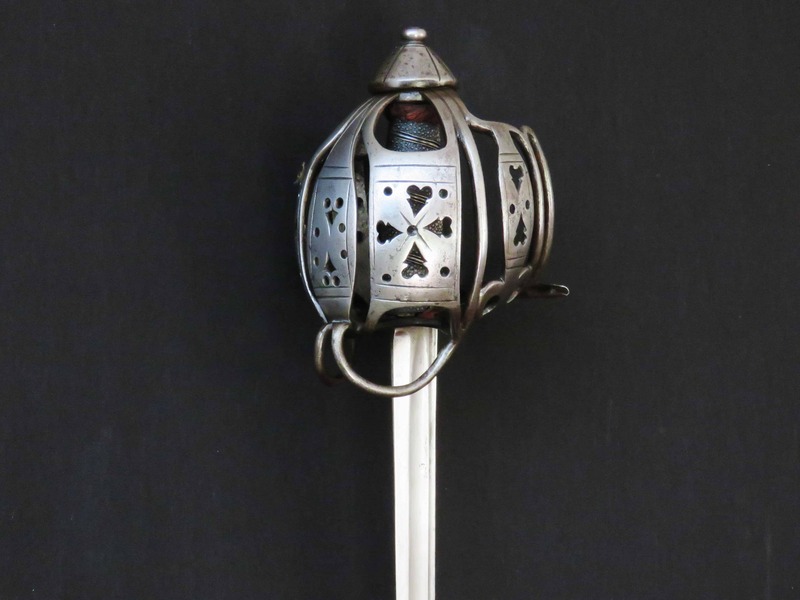 The pommel is cone shaped with four sets of double lines, with rows of dots imbetween, radiating from the well formed, tall and deeply waisted button on top. 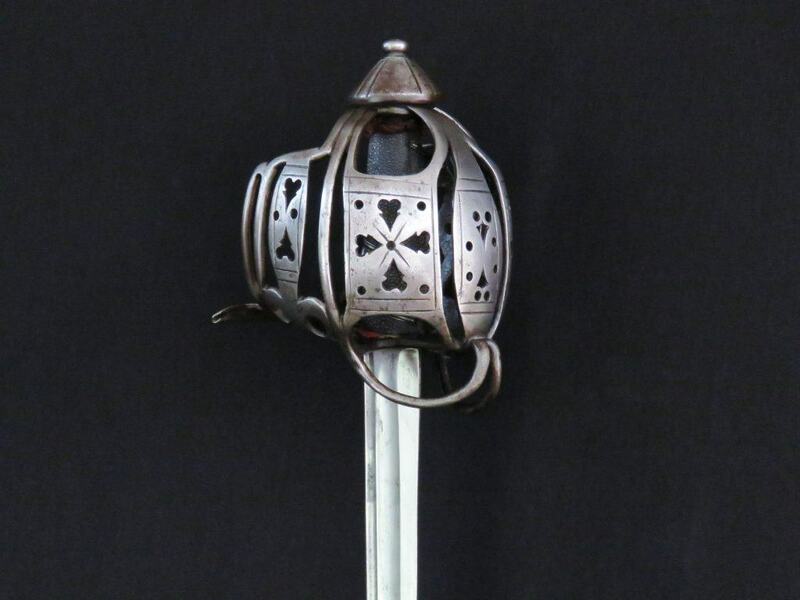 The three upper arms of the guard are securely tucked into a groove cut around the lower half of the pommel. 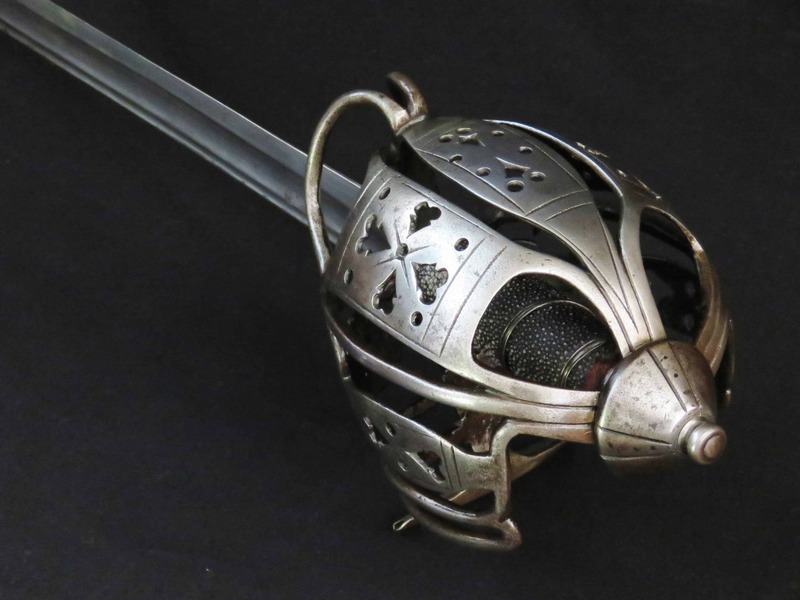 The sword hilt is tight and secure. 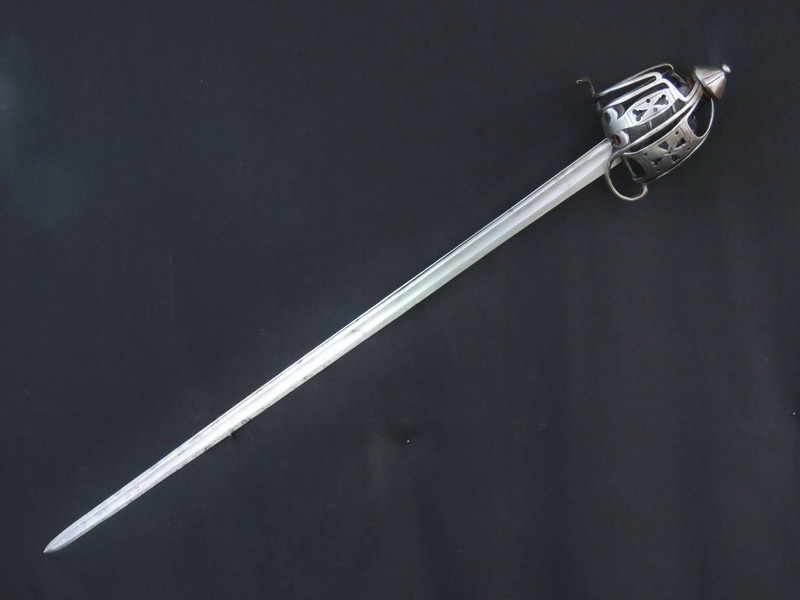 Of tapering back sword form the blade has a short ricasso. 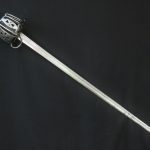 The shoulders sit in a pronounced groove cut into the underneath of the cross guard bar. 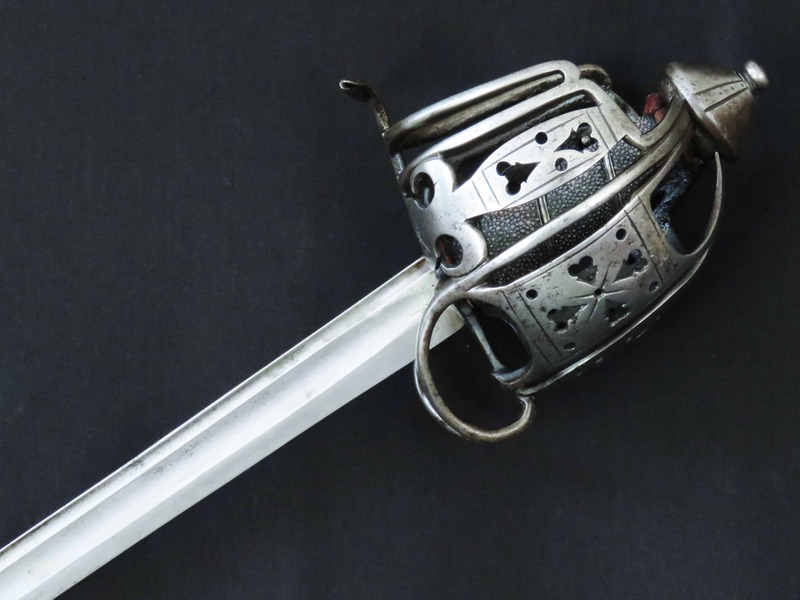 A broad fuller extends from the hilt down the middle of the blade almost to the tip, and tapers in proportion with the blade. 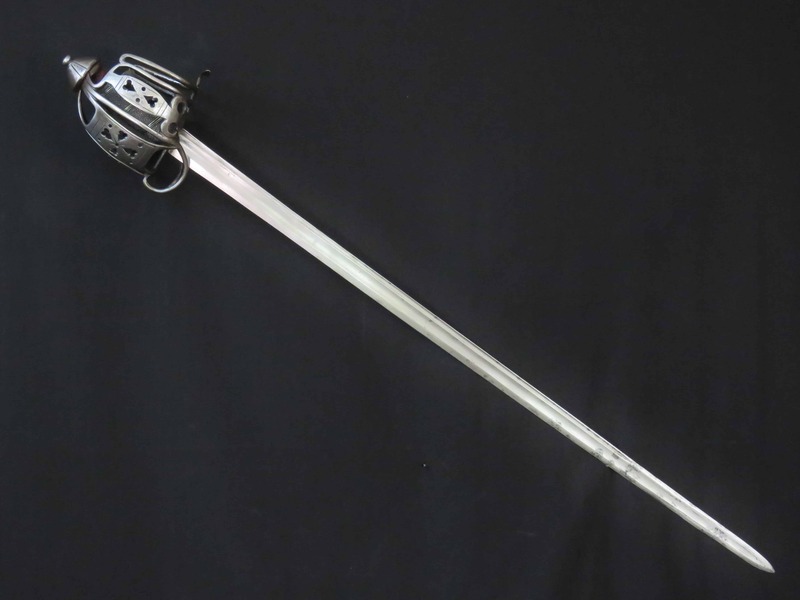 A deeper, narrower fuller, runs from the hilt underneath the spine and fades away circa 10 inches (26 cm) from the tip. 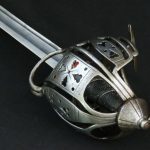 The blade has obviously seen use on more than one occasion. 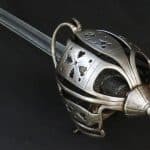 Some minor nicks to the cutting edge have been filed out over time, especially towards the tip, whilst other, presumably more recent nicks, have been left unattended, now smoothed with age. 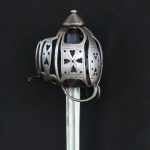 The spirally grooved baluster shaped grip is of wood and covered with shagreen bound with a flat silver band in the grooves flanked by narrower wires. 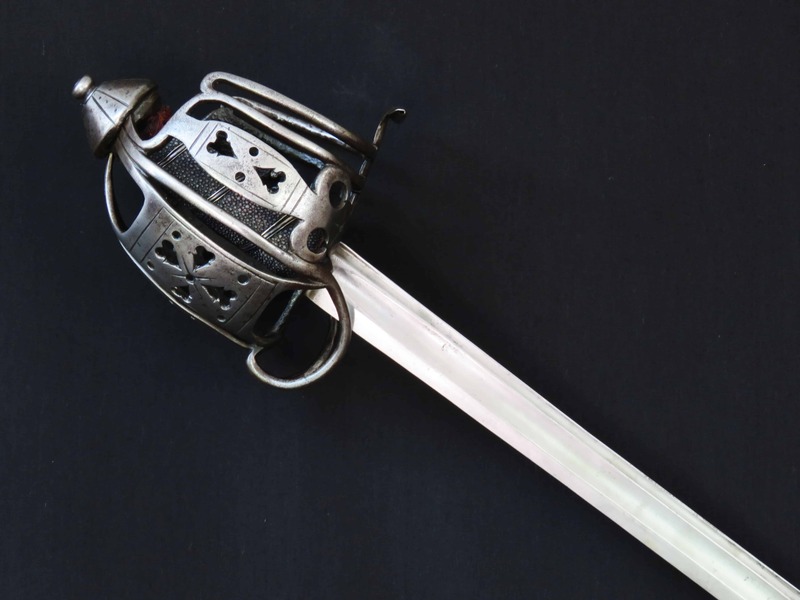 The remains of a leather liner at the base of the grip is still visible. 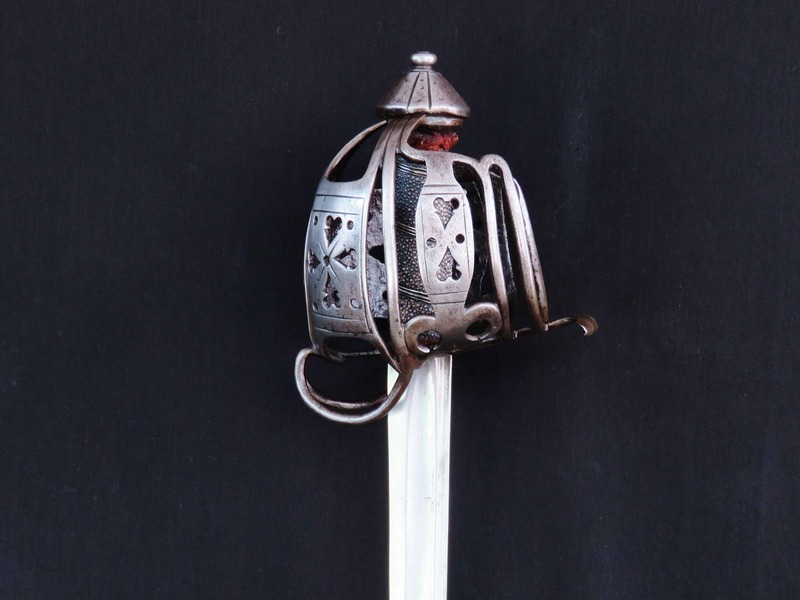 An old red woollen fringe is present between the top of the grip and the pommel base. 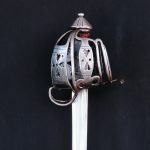 This is a fine quality “meaty” sword which handles well with lovely proportions and in fine overall condition, a nice example of its time. 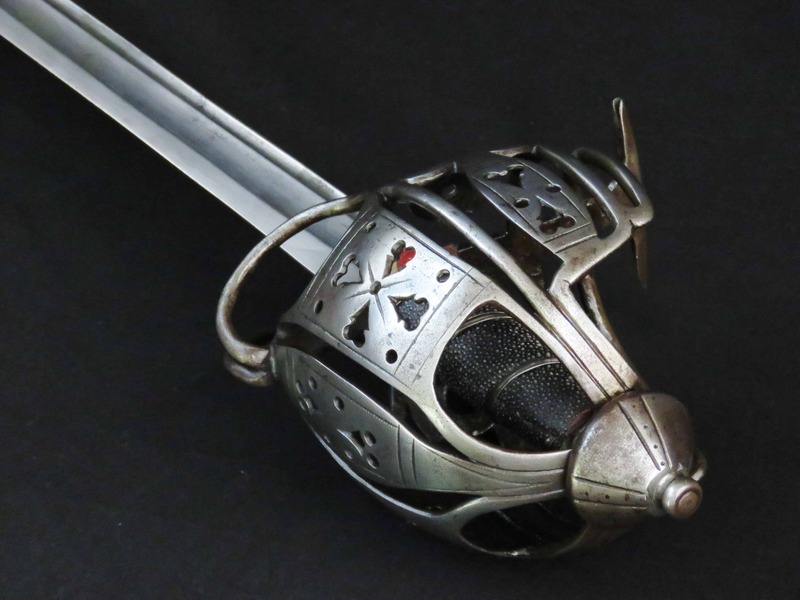 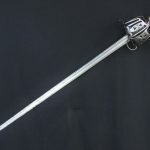 The blade is 35.75 inches (91 cm) and overall the sword is 42 inches long (107 cm).